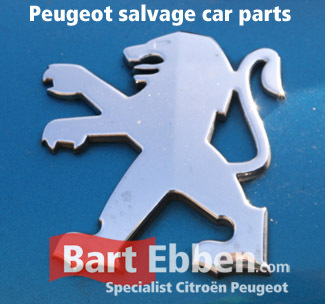 Best quality Peugeot Car Salvage parts is what Bart Ebben supplies. 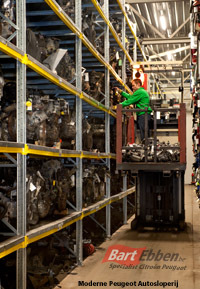 Straight from an impressive warehouse used Peugeot parts are shipped all over the world. As a modern Peugeot Car Salvage yard parts are selected very carefully and come with a full history. Our salesmen will provide you the exact carpart you need, especially when you can give us your Peugeot VIN-number to make selecting easier. You can choose from a wide range of parts like an engine, cylinder head, gearbox, turbocharger, ECU computer, airbag, steering pump, steering rack, exhaust manifold, radiator, aircon compressor, window mechanism, door, bonnet, head light, bumper, engine oil sump, seat, etc. Apart from electronic parts the spares come with the warranty of your choice. The length of the partwarranty is a matter of choice, please have a look at our warranty options here. Often (second hand) Peugeot car salvage parts are a very welcome alternative to new parts. The prices are roughly around half the normal dealer retail price. You can find the salvage car part for your Peugeot in our online catalogue, or send us a part request ! Find used car parts on our website for 106, 1007, 107, 108, 205, 206, 207, 208, 2008, 306, 307, 308, 3008, 406, 407, 508, 5008, 605, 607, 807 & RCZ. You can also find salvage car parts for the commercial vehicles or MPV's like the Peugeot Bipper, Partner, Expert and Boxer vans. For over 35 years we have been a reliable supplier for second hand Peugeot autoparts and our know-how still grows each day. Therefore we are very capable of finding the right used car part for your model. We ship Peugeot salvage car parts worldwide every day, using proper packaging material and experienced, automotive shipping companies we do everything within our power to get the parts to you in a reliable way and within a reasonable time. We also specialise in Citroen salvage car parts because of many similarities.